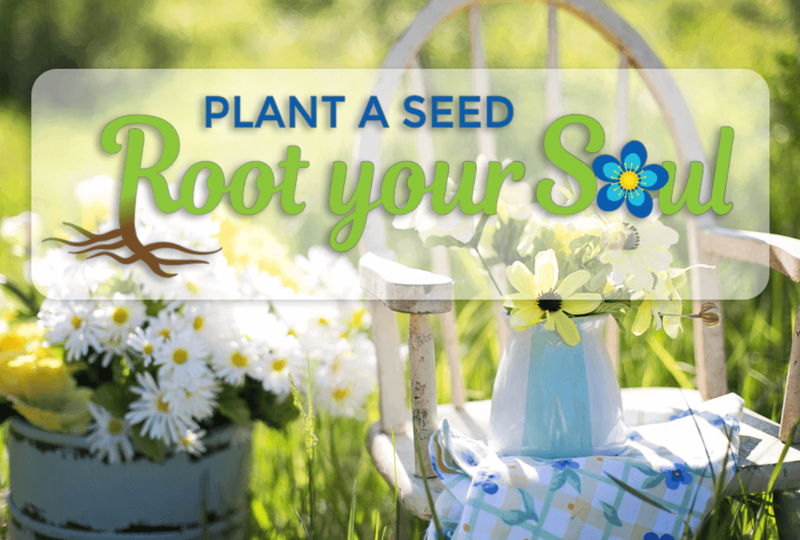 Have we mentioned just how excited we are for our “Plant a Seed, Root Your Soul” retreat? Oh my goodness, if you haven’t heard of it, you simply must check it out here. As excited as we are for the retreat, we are even more excited to give one ticket away! Thanks to our friends at Thrifter’s Rock, we are offering a free ticket to one entrant that we will choose at random. All you need to do is fill out the form below and you will automatically be entered! So sign up now! We are cheering you on! Contest runs from February 27, 2019 through Noon March 5, 2019. The drawing will be held later in the day on March 5. Winner will be notified by email. The entrant will receive their ticket at the registration table on the day of the event. The winning prize value is $125. The prize cannot be traded for cash. The prize is the prize is the prize. Must be 18 to enter to win. Prize does not include transportation to or from the event. Here is the bottom line: Alaska imports way too much food. This not only leaves us vulnerable to natural disasters, and national emergencies, in many cases, it also means diminished nutrition in the foods we purchase to nourish ourselves and our families. Less than 4 months ago, we experienced an earthquake that should have served as a wake-up call. Alaska is vulnerable to events that can cut us off from our primary food source. I often hear how it is impossible to provide the foods we need here in Alaska. 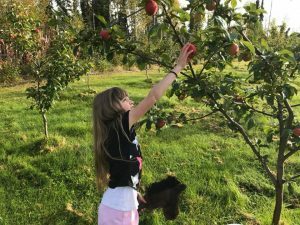 Sure, we can’t grow some things some of us may be accustomed to, but our basic needs can be met within Alaska if we work as communities and support our local growers. 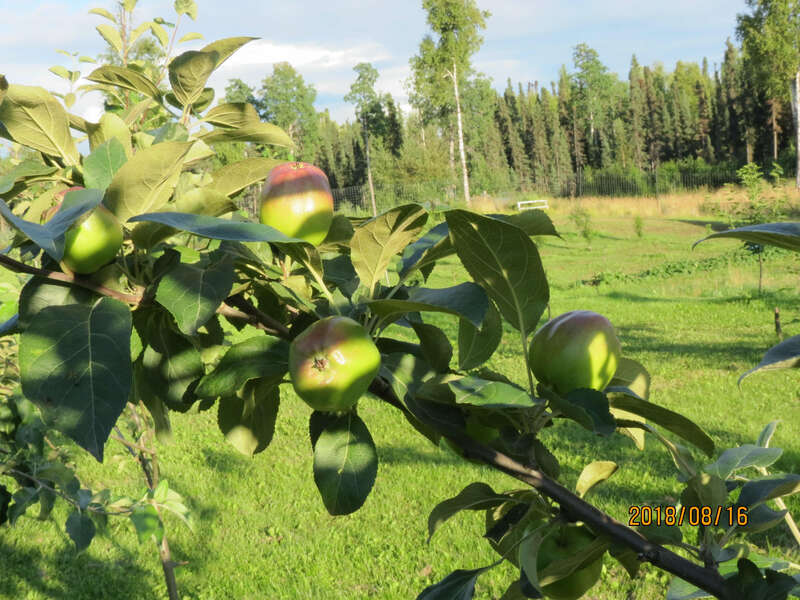 Currently, local farmers are working to provide more #alaskagrown diversity. Rhubarb juice, honeyberries, cold hardy cherries, and more! Food security in Alaska is not impossible. It will require deliberate choices with a vision and heavy collaboration within communities. 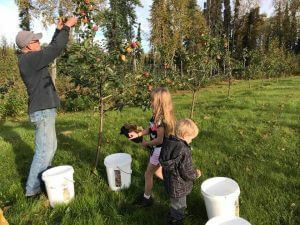 How will you support Alaska grown? Will you add space in your back yard to supplement your own groceries, start a farm, or support local farmers? This is an exciting time to be involved in agriculture here in Alaska. 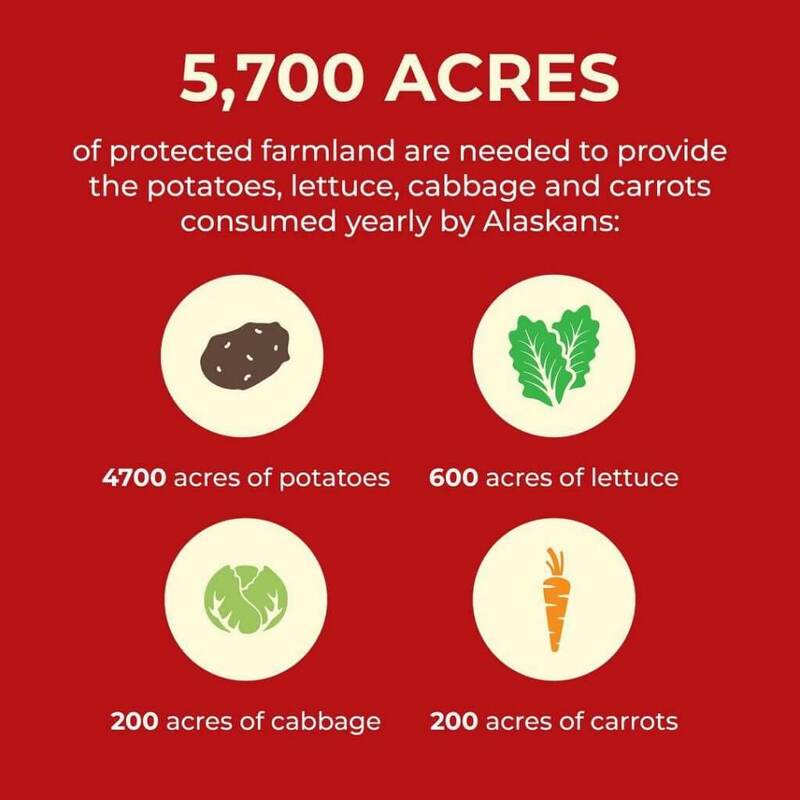 By the way, hat tip to Alaska Farmland Trust for the photo. And if you are looking for farmland – they provide amazing opportunities for beginning farmers. Can you feel it? It’s El Nino and the experts are saying it is back. What does that mean for us here in Alaska? According to KTVA it means a warmer and wetter remainder of the winter and early spring. We have already seen above average snowfall in our location. As a farmer, there are good and bad aspects of this weather pattern. 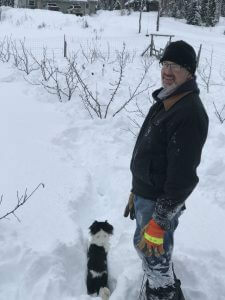 Clearing snow away from the tree trunks in the orchard. Snow provides insulation for our crops that are wintering over which certainly helps them survive our harsh arctic climate. 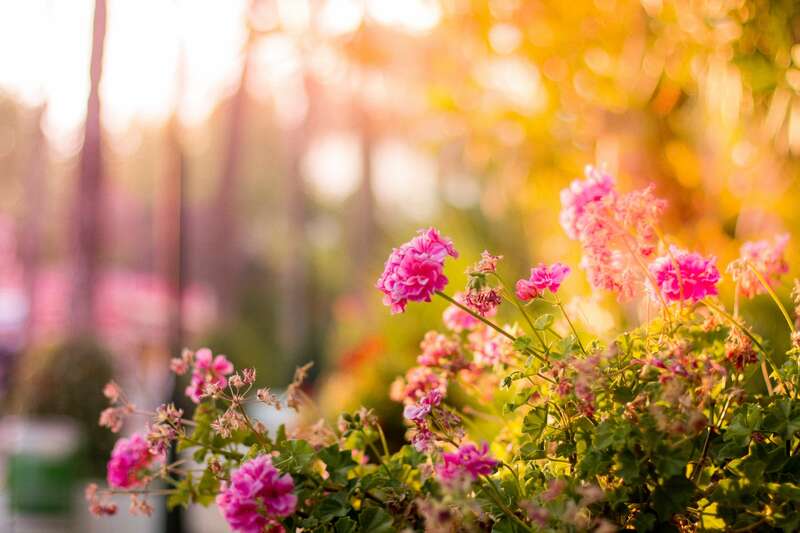 An earlier and warmer spring could provide extra days growing days early in the season which is always a plus. But, extra snow requires diligence. In the fall, we have to wrap each tree trunk with sheet metal and the bushes are wrapped in aluminum foil. This is to keep hungry burrowing rodents from chewing circles in the bark and ultimately killing the plant. Extra snow means we must sludge our way through the snow to dig it away from the trees to the top of the metal protection. With over 300 plants, this provides a great workout over the winter! We will see how it plays out! Either way, spring will start to show itself in a few weeks. Are you as excited as we are? Every stalk of corn tended carefully all summer; gone. With only one greenhouse, every square foot of space inside is carefully allotted. Over 1/3 was planted in corn and it was growing and kerneling up nicely. We were going to have quite the crop! In Alaska, this is quite the feat! So you can imagine my shock when I started the water and the plant started to lean, roots ripping from the ground as the top-heavy stalks gave way. It started in one corner, each stalk falling into the next like precisely placed dominoes. Your farmer came in and could immediately tell that I was frustrated. 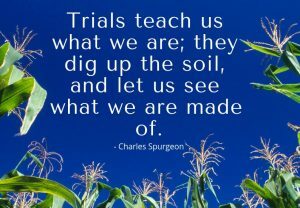 Like us, corn is able to stand tall even through major windstorms, because it grows deeper roots with every small storm. Nostalgia moment: I remember when I was in high school and I hit a deer while I was driving to town. My car was totalled and I was stuck. This was before the days of cell phones and no one lived anywhere near where I hit the deer. A man in an old logging crummy came by and saw that I was in trouble. He gave me a ride down to the store where my dad was working. Even though I had never met the person that picked me up, I had absolutely no fear of him. Nothing happened in our town to give me reason to fear. In the world that I grew up in and knew, everyone was safe. Not all people were friendly. Not everyone had the same family values. But everyone was safe. Fast forward to today and it seems like everyone suspects everyone. We read on Facebook where someone will see a car driving slowly through their neighborhood and will send out an alert only to find out that they were lost and needed directions. People who are broken down on the highway sometimes sit for hours waiting for help because no one has the time or feels safe enough to help. I actually read an account of a mom who went off the road into a snowbank and sat on the side of the road for a couple of hours with her children in the car and not one person stopped to see if she was okay. Right here in my town! It is so hard to maneuver this world right now. The bad guy doesn’t look like a bad guy. Thieves are bolder than ever. Instead of kindness, people seem to thrive on bullying. New neighbors bring suspicion. It is hard to know what is right and who we can trust. But I honestly think that the only way to stop the cycle of suspicion and animosity is to put our devices down and get to know one another. Face to face. 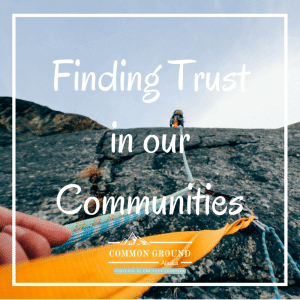 Once we know the faces of our friends and neighbors, it will be easier to know who we can trust. It will be easier to identify the scoundrel. Another nostalgia moment: I remember sneaking up to my neighbors house, ringing her doorbell and running off quick to leave her a surprise bouquet on May Day. It was fun. It was innocent. It was kind. I also remember taking a homemade treat to a friend who is having a hard time or dinner to a family who just had a baby. We used to love each other well. And we KNEW each other well. We MUST stop looking at screens and start looking into the eyes of those around us. And then we need to start taking the time to get to know them. To be helpful. To be kind. How do we go about this? I have a few ideas mostly from things I remember from my childhood. When a new neighbor moves in, go meet them. Take them a pretty plant to welcome them to the neighborhood. 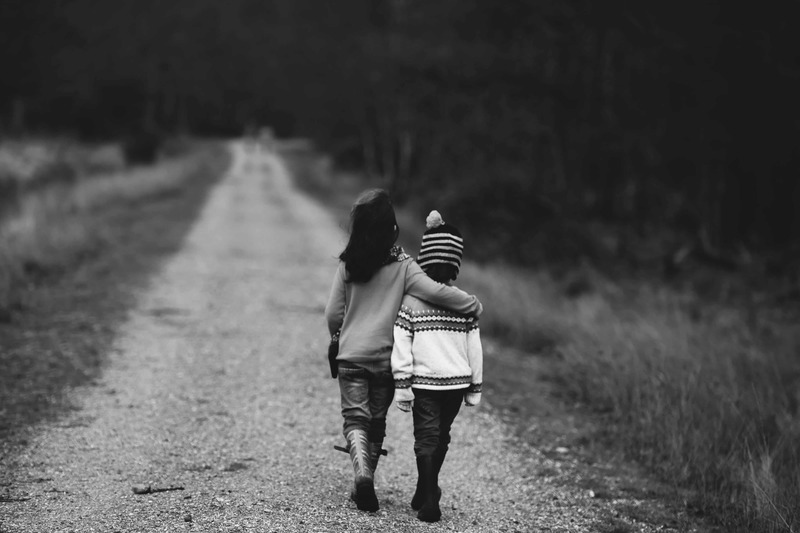 Are there kids near you that are your kids ages but you aren’t sure if they are kind? Invite them over to play games. Pop up a big bowl of popcorn to share. Do this often as you get to know them. Do you know someone who seems lonely? Maybe an elderly person who doesn’t seem to have anyone around? Go visit them! Buy a packet of wildflower seeds and scatter them in an unused area of your yard. Water and fertilize them well and then pick them in the fall and give bouquets to the grocery store check out clerks. See someone outside shoveling their driveway? Stop and offer to help. Thank your postal workers by bringing them some homemade bread and jam as a thank you. What we don’t know tends to make us suspicious. So let’s connect and bring the unity back into our communities! Apple harvest day! It was a little later than usual which certainly built up anticipation. As a farmer, this is one of the most important days of the year. It’s harvest day at Common Ground Alaska! 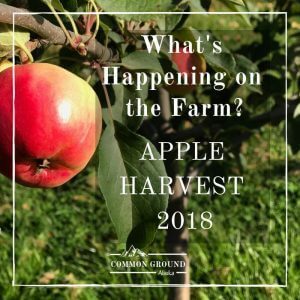 Would we have enough apples for all of the cider, applesauce, and pie filling that we want to preserve for the coming year? Would we have extra to give to friends and family? 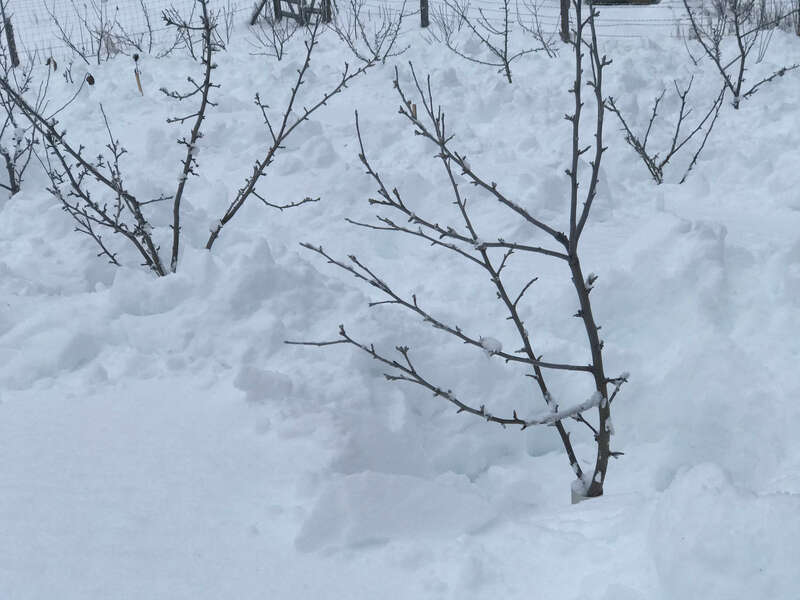 And the big question – does it look like the trees will be mature enough to support our u-pick dreams in 2019? 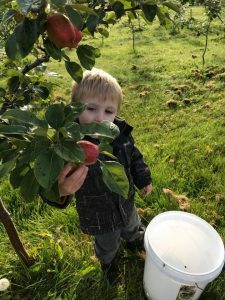 We had to bring in help for this year’s harvest – our two-year-old grandson was more than happy to pitch in. He and his aunt Abbi enjoyed the fruits of their labor sitting in the sunshine later that afternoon. It was a very good day filled with laughter and sunshine – the perfect signal to the end of growing season 2018. We now have more than enough applesauce and apple pie filling saved up. There is lots of sweet cider in the freezer and there is even some hard cider fermenting in the closet. 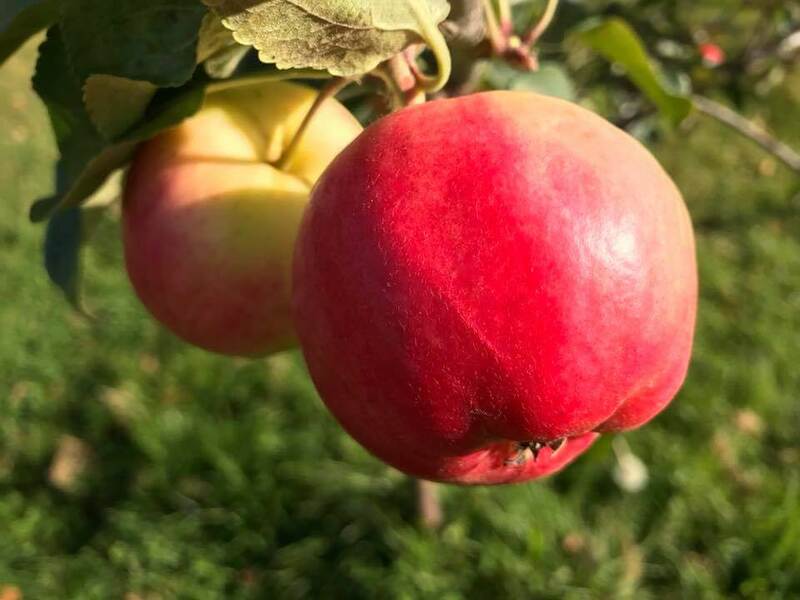 Will we open for u-pick apples next year? That remains to be seen. For now, we are just going to enjoy the fruits of 2018. Marking the close of summer’s endless daylight and fall’s crisp colors, winter has shown it is ready to make an appearance here in Alaska. 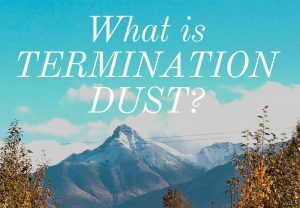 If you are not already aware, termination dust is the term used for the first snow on the mountains in the fall. Legend has it that snow will fall on the valley floor within 6 weeks of the first showing of snow on the mountain peaks. Originally the term termination dust was used by construction workers meaning their seasonal work would soon be “terminated”. Either way, termination dust ushers in Alaska’s longest season, winter. Termination Dust signifies to Alaskans that winter will not be held back much longer, terminating the end of another glorious summer in Alaska. Some rejoice when they see dust on the mountains. They live for winter activities! For others, a sense of dread is hard to shake as we start to spend the darker evenings inside and pull out our boxes of Baffins and wool mittens. Either way, winter is on its way. And since we’re Alaskans, we are going to make the most of it! Have you seen Princess Bride? If so, you will recognize the name of our farm dog. Fezzik lives up to his namesake in most regards. 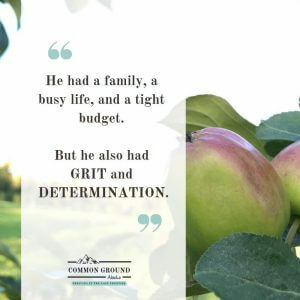 He is fiercely loyal to his farm and family. He is a gentle friend to those he trusts. And, though he’s not a giant, he is not small! Sweet Fezzik is pretty low key most of the time. He spends his days walking the fencelines or watching for anything amiss. He spends his nights listening for danger, intruders, or his worst enemy — moose! Fezzik takes his moose watch seriously. When an angry mama moose charged him, he charged right back using his big body and even bigger bark and chased her back into the woods. He is ever aware of all of the goings on and is not afraid to help any way his protective brain tells him is necessary. 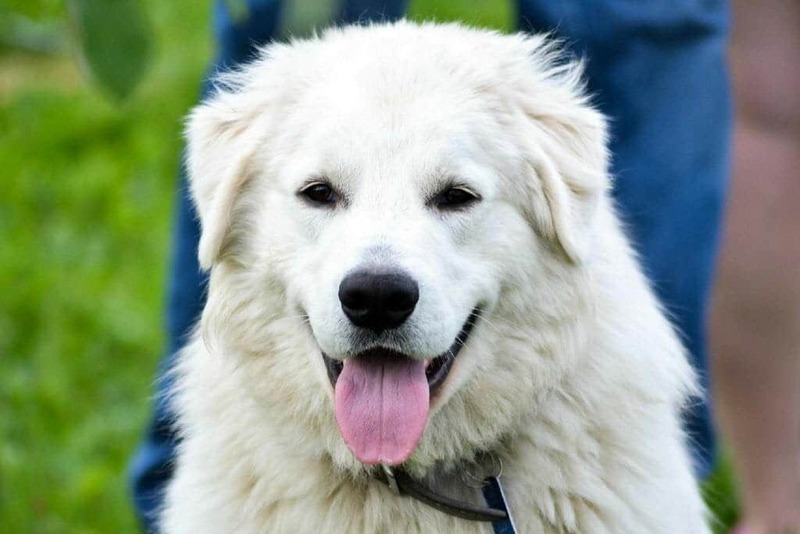 He is a livestock guardian (Maremma) but since he doesn’t have livestock to guard at this time, he guards his people and his orchard with all of his might. Anytime we are outside, he is right there with us. If we dig, he digs. If we pick berries, he waits for us to hand him some to eat. If we sit at the bonfire, he sits with us or near us, ever aware of our surroundings. Fezzik’s loyalty and heart for his people and farm inspire me to be a better, more loyal human. He is always on the lookout for what is best. If I’m sad, he will just come to sit quietly with me, resting his head on my lap. If I am nervous, he picks up on it immediately and stays by my side until I am out of harm’s way. 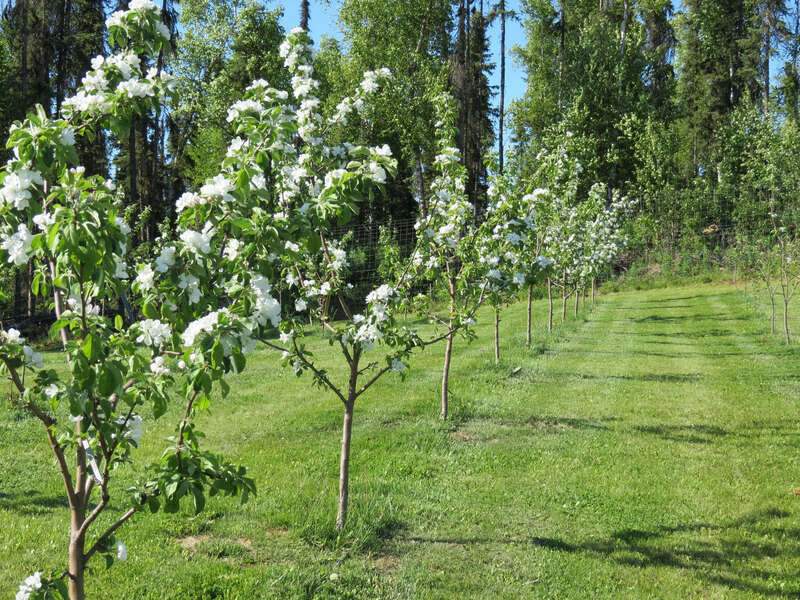 If there is a critter close to the orchard, he runs them off without hesitation or fear. 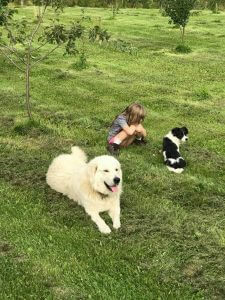 Fezzik, the maremma alaska farm dog, protecting his orchard and his little girl. 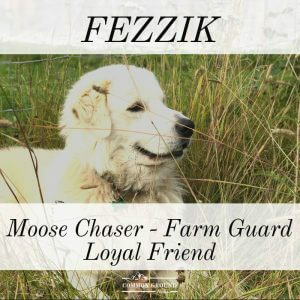 Fezzik the Alaska Farm Dog is ever aware of his surroundings and protects his farm and people well. 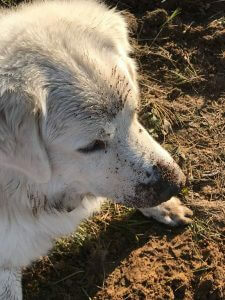 Fezzik the Alaska Farm Dog loves digging in the dirt as much as his farmer. I agree that dogs are man’s best friend, but I also think they are a farm’s best friend. Don’t you? There once was a fellow who had a passion for farming. This wasn’t just something he loved but it was also something he was very very good at. It brought him satisfaction to see a seedling grow to produce fruit. He enjoyed seeing chubby grins of toddlers eating a fresh strawberry. And it did a good work on his soul to build up and nourish his ground and bring the soil to life. He had an uncanny ability to be able to run the dirt through his hands and see what was lacking and what was good. But that farmer moved from a moderate climate to a harsh, barren land where folks said it would be crazy to try to farm. There were plenty of things to do outdoors in Alaska, he didn’t need to plant anything. So he thought. After a couple of years, he found himself thinking about fruit trees and compost piles. So he started to research. Know what he found out? There were people in Alaska who farmed – and it was working for some! This was exciting! So he resourced, researched, asked questions, and he bought a rototiller. There were many hurdles. He worked full time and commuted 3+ hours per day. He had a family, a busy life, and a tight budget. But he also had grit and determination. So one day, he started clearing a field. Just a small area. He chopped trees, tilled ground, hauled manure, and wore through several pairs of leather gloves, but before long he had a fenced in area that had rich, soft dirt. It was time to plant some dreams in the form of apple trees. The farmer’s story is still developing. Harsh winters, unscrupulous vendors, disease, discouragement, time and money constraints all worked against him as he pursued his dream BUT HE KEPT ON. After five years of waiting, praying, and wiping his brow, this fellow, your farmer, is on the brink of making his dream a reality. So if you have a dream, a calling, a passion, or just something you are wanting to do, know this. Your farmer and I are cheering you on! We would love to hear all about it and support you any way we can! What is your dream and what are you doing to make it a reality?